Are corporations allowed to sell healthy food? Personally, I would like to serve a healthier product. But, if these efforts threaten profitability, I risk getting sued by stakeholders. Corporations are obliged to pursue maximum profits and no other goal. The executives' response is not entirely correct. Courts give a lot of deference to corporate management to use their own best business judgment. Admittedly, a corporation cannot simply give away profits freely to serve public causes like better nutrition. However, the managers have plenty of legal maneuvering space to develop a healthy product line, without fear that shareholder lawsuits will succeed. A recent working paper (.pdf) by Tufts economics professor Julie Nelson reviews the long history of relevant court cases. She finds that, when people argue that the law requires profit maximization as the sole goal, they commonly are really describing their wishes that this were true, not evidence that it actually is true. The profit maximization doctrine appears to operate far more strongly at the level of theory or ideology, than at the level of the actual practice of business management and corporate law. It seems, in short, to be a case of transcendental nonsense. Nelson also tackles the more philosophical question of how profit-seeking should be related to other virtues and relationships, even love for our fellow person. I suspect that I like markets better than she does, on balance. But, like Nelson, I think markets should not be a social goal in themselves. They are a means to achieve bigger goals. Just as a tennis game is most fun when two friends compete hard by the rules, I think competitive markets make our society better. Markets are a great game, but a dreadful religion. If one can argue with a straight face that selling healthier food enhances the reputation and long-term prospects of the company, I think that would count as a reasonable business judgment. Corporations may not want to make sacrifices, but I doubt many claims that they are legally prevented from serving healthy food. To reduce greenhouse gas emissions in response to climate change, it is essential to reduce energy use in the U.S. food system. A USDA report this Spring described trends in exactly the wrong direction. USDA economist Patrick Canning and colleagues estimated that energy use in U.S. agricultural and food industries increased by 23% -- from 11.5 to 14.1 quadrillion British thermal units -- from 1997 to 2002, the most recent data available [typo corrected Sep. 7]. The increase is so large that it accounted for 80 percent of all increased energy use in the United States. 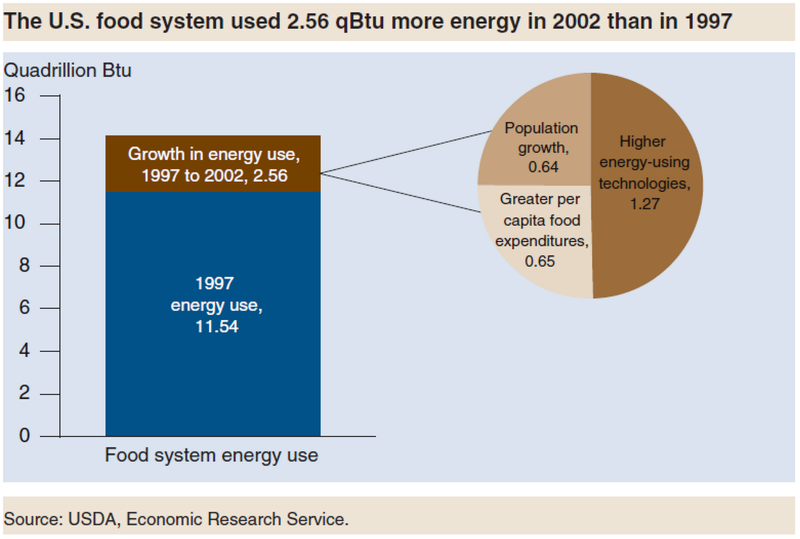 Only one quarter of the increased energy use in the food system is due to population growth. Another quarter of the increase is due to increased food spending per person. 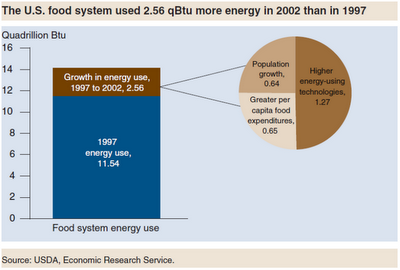 Fully half of the increase was due to adopting more energy intensive technologies in the food system. At a time when one might expect that Americans would adopt more energy efficient technologies, we did the opposite. We continued to move from labor intensive to energy intensive methods throughout food production and manufacture. A fascinating accompanying article (.pdf) in the USDA magazine Amber Waves gives the example of adopting high-technology energy-intensive hen houses in the egg industry, increasing energy use per egg by 40%. Consumers, similarly, were splurging on energy rather than economizing. We purchased more dishwashers, microwave ovens, self-cleaning ovens, and second refrigerators than ever before, so our own household food systems were also becoming more energy intensive. In some circles, there is a temptation to hope that technological improvement will solve our energy and climate change problems, making it unnecessary to change consumption habits. This research casts some doubt on this hope. Consumption change remains important. Based on 2002 energy technologies, if households choose to substitute a portion of their at-home meat and egg consumption with expanded fish and fresh vegetable consumption, for example, there could be substantial savings in energy usage. Reread this sentence. This is a bold conclusion for a USDA magazine article. During a year of my youth spent living in Bandung, Indonesia, the world's most populous Islamic country, I never made it through a whole day of fasting without at least a snack or a little water. In part, social roles for hosts and guests forced me to eat something to be polite, even with the host was keeping fast. I was struck by the fasting practice of neighbors such as the becak (pedicab) driver and day laborers who hung out on the street corner by our house. Any one of them, who at the time in the 1980s earned about $30 per month, could explain without any discernible irony that they kept the fast so that they might know what it is like to be poor and hungry. In the same vein, consider this month the fast being kept by people in Pakistan who are suffering from floods. Last night, I took my two children to the community Iftar -- or evening meal after the fast -- hosted by the Islamic Center of Davis, CA. Hundreds of people turned out for the call to prayer, a delicious meal, and a moving and lively sermon by Sheikh Alaa' El Bakry about "The Rights of Neighbors." In one passage, he contemplated our modern lives, in which we think our neighbors are the like-minded people with whom we text and twitter. Imagine our surprise, in a time of crisis, such as a house fire, when we find ourselves going next door for help from the person who is more literally our neighbor, but with whom we haven't ever tried to bridge differences and talk. Muslims, Christians, Jews, and secular folk crowded in until the auditorium's long tables were filled and many ate standing along the walls. There were warm greetings for ministers, rabbis, officials from the police and FBI, and local politicians. One state legislator, who is Japanese American, reflected on the futility of ignoring the current climate of fear of Muslims, knowing and remembering that any community may have its turn in the crossfire. Even many of the non-Muslims kept fast for the day, which gives a special appreciation for the Iftar. I made it through the complete daily fast yesterday for the first time in my life. 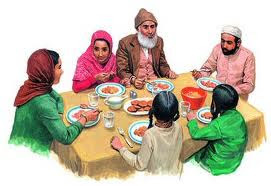 My children, ages 8 and 10, chose to fast from noon until the evening dinner. I am happy that they could participate in such an event. Ramadan lasts this month until about September 10.